The 18-hole Cathedral Canyon Country Club in Cathedral City, CA is a resort golf course that opened in 1970. Designed by David Rainville, Cathedral Canyon Country Club measures 6505 yards from the longest tees and has a slope rating of 130 and a 71. Nestled in Coachella Valley, Date Palm Country Club sits at the base of the San Jacinto and Santa Rosa mountain ranges, providing nearly every hole on the golf course with a stunning view. The layout is on the shorter side, but it still has some challenging holes. The 18-hole Eighteen Hole at Outdoor Resort & Country Club in Cathedral City, CA is a private golf course that opened in 1985. Designed by Ron Garl, Eighteen Hole at Outdoor Resort & Country Club measures 1815 yards from the longest tees. The 18-hole El Cielo/Los Lagos at Desert Princess Country Club in Cathedral City, CA is a private golf course that opened in 1985. Designed by David Rainville, El Cielo/Los Lagos at Desert Princess Country Club measures 6600 yards from the longest tees and has a slope rating of 126 and a 72. The 18-hole La Vista/El Cielo at Desert Princess Country Club in Cathedral City, CA is a private golf course that opened in 1985. Designed by David Rainville, La Vista/El Cielo at Desert Princess Country Club measures 6816 yards from the longest tees and has a slope rating of 131 and a 72. The 18-hole Los Lagos/La Vista at Desert Princess Country Club in Cathedral City, CA is a private golf course that opened in 1985. Designed by David Rainville, Los Lagos/La Vista at Desert Princess Country Club measures 6706 yards from the longest tees and has a slope rating of 127 and a 72. 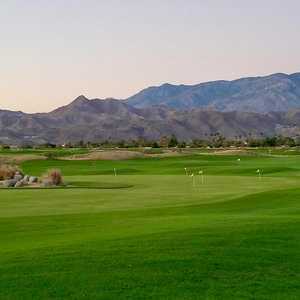 The 9-hole Nine Hole at Outdoor Resort & Country Club in Cathedral City, CA is a private golf course that opened in 1985. Nine Hole at Outdoor Resort & Country Club measures 561 yards from the longest tees. The greens are winter rye grass and the fairways are bermuda grass. The 18-hole Pebble Course at Cimarron Golf Club in Cathedral City, CA is a public golf course that opened in 2000. Designed by John Fought, Pebble Course at Cimarron Golf Club measures 3020 yards from the longest tees and has a slope rating of 105 and a 58 USGA rating.